When I was in High School, I read Heir to the Empire, Book 1 in Timothy Zahn’s “Thrawn Trilogy.” Set five years after Return of the Jedi, these books (and the two that followed) were the Star Wars sequels I dreamed of one day getting to see on screen. An action-packed, well-crafted trilogy that honored the original characters while expanding the universe. In his series, Zahn introduced Grand Admiral Thrawn, a villain good enough to follow Vader, and that’s saying something. Fast forward a few years later, and the Star Wars prequels come out. Ugh. To para-phrase Obi Wan, those films were not the droids I was looking for. My disappointment with the prequels was compounded by the fact that I knew there was a great Star Wars story out there waiting to be told. I had read it! Zahn’s sequels were superior stories by far. Today, JJ Abrams & Co. are giving us different sequels, and I’m loving them, but I’m also excited that the folks at Disney have been smart enough to recognize Zahn’s contribution to the Star Wars universe as well. Thrawn is now officially Star Wars cannon, having been reintroduced to the world via the animated series, Star Wars: Rebels. 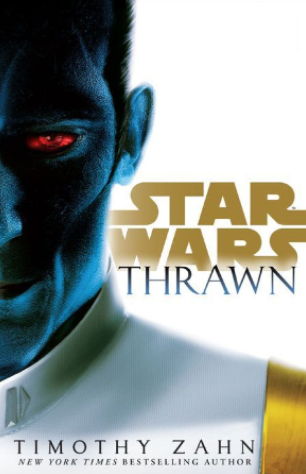 And, now I find out Zahn has a new Thrawn novel coming out next month? Talk about a new hope… I’m in. I loved the prequels! though the story had its flaws, i still enjoyed them. All of the alien species and cultures really sparked my interest. Have you see The Clone Wars the animated series? That was an amazing series and it really gave some depth to anakin skywalker in my opinion. In JBA we saw a bunch of aliens, including the rustov, but we never got to learn much about the rustov culture. Are there still secrets about them we don’t know? Most definitely, but I would want to explore more of Empire City before going back to the Rustov. I want to take a deep dive into Karateka, Varagog Village, Cognito, etc… Still feel like I only scratched the surface of that world. I saw some of the Clone Wars eps, but not much. I’ve seen a bunch of Rebels, but have not gotten to where Thrawn is introduced yet. That’s on my list too! My kids also loved the prequels, so you’re in good company ;] My problem w/ them is that the characters were never developed very well. Too much time spent on 30 minute chase scenes, pod races, etc… not enough character scenes. The only reason you care about anything in a story is b/c you care about the characters. Han Solo, Leia, and Luke were all fully formed, three-dimensional characters. Didn’t feel that way about anyone in the prequels. And, it’s a shame, b/c I think the basis of a great story was there, but Lucas’s screenplay didn’t deliver. He was too focused on what he could do w/ the special effects. He should have gotten Lawrence Kasdan (Empire Strikes Back, Return of the Jedi, Raiders, Force Awakens) to write the script. ooh that’s exciting! I have always wanted to learn more about varagog village, and the people there since its my favorite borough. I even came with a fan character from Varagog Village and a story for that character as well. The Clone Wars is a show that starts out as average but by the end it makes you want to cry. I highly recommend it! in fact it gives a lot of character development to the prequel characters that was never shown in the actual movies, while still fitting into the cannon. Still i totally agree with you about character development, it is what makes the story enjoyable to watch!